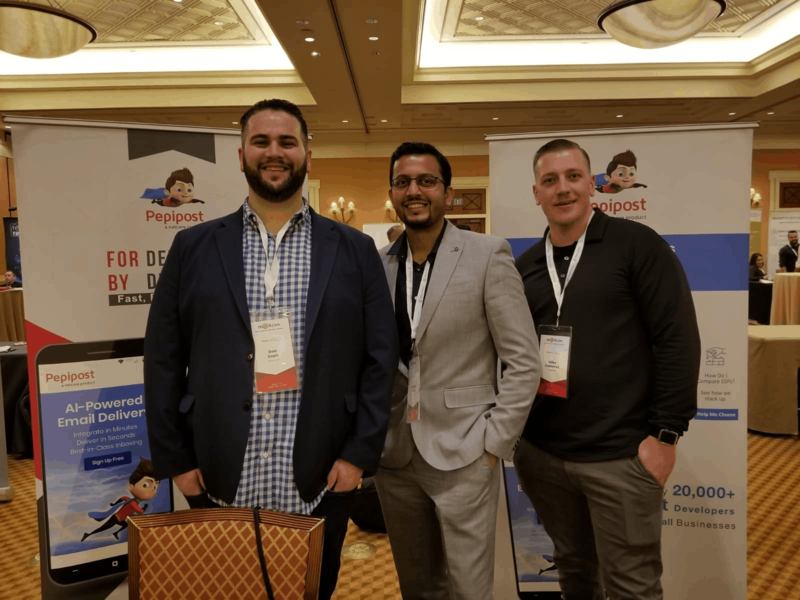 I kicked off 2019 at Mailcon in Las Vegas promoting Pepipost’s AI-Powered email delivery engine. We were thrilled to be part of this exciting and engaging event. For those who don’t know, MailCon brings together over 500 email marketers, entrepreneurs, and technology leaders mailing in a variety of verticals including financial services, healthcare, home services, professional services, and travel. We had a fantastic time meeting with clients, prospects, and partners, and learning about what they care about most. Here’s a picture of the Pepipost crew at our booth! The timing of the conference couldn’t have been better as it came on the heels of our recent Ongage and Pepipost integration announcementwhich combines Ongage’s powerful front end campaign management capabilities with Pepipost’s Artificial Intelligence-based email delivery solution to help smart marketers reach their audience more effectively than ever. Our friends at Ongage also had a booth at Mailcon. Their clients were very excited to have an additional resource they can leverage in their email stack. Within this space, we have found that ensuring campaigns see good deliverability to their target audience is always top of mind a priority. That being said, several underlying concepts kept coming up. What exactly is AI-ML when it comes to email delivery? Artificial Intelligence and Machine Learning are hot topics these days. Numerous attendees were asking us how we use AI and ML to help our customers better reach their end users. The areas we’ve seen AI & ML have the largest impact include content optimization, data segmentation, send time optimization, delivery optimization, and reporting/actionable analytics. In order to achieve optimal inboxing, it is important to make sure your users want your content. This starts with a good opt-in process up front. Forms should weed out bots and misspelling. You would be surprised how often someone misspells a domain name! Ideally, opt-in forms should call this out in real time. You should still make sure you are cleaning out all misspellings on the back end. There were a number of vendors in town that help with this. How to phase out non-engagers was also top of mind for a number of big emailers. Focusing on engaged users is a great strategy for a number of reasons. The major ISPs will look at how your users are engaging with your list and apply that to where they send your mail. Over-emailing, non-engaged users can trigger your sends right to the spam folder. If a user does not engage for quite some time, that email address might not even be live anymore and can eventually become a spam trap. This makes having a sunset policy extremely important. Mailers should also be careful with re-engaging old users, making sure there is a continual cleansing process run against your data. How do I get my subscribers more engaged? We had a super awesome time at Mailcon this year and will be attending many more events and we will surely keep you updated. We would love to hear your suggestions for any events you think we should attend or would like to meet us at any event where we are present. It is always a pleasure interacting with our community and we always look forward to it. Stay tuned, Cheers! !